This family-friendly tour is perfect for those seeking a little adventure on their vacation; high speeds and tight turns combine the rush of an amusement park ride with the thrill of a safari. Meet at Bayside Market in Downtown Miami at 2pm, and hop in a high tech tour bus that will take you to explore the Everglades. 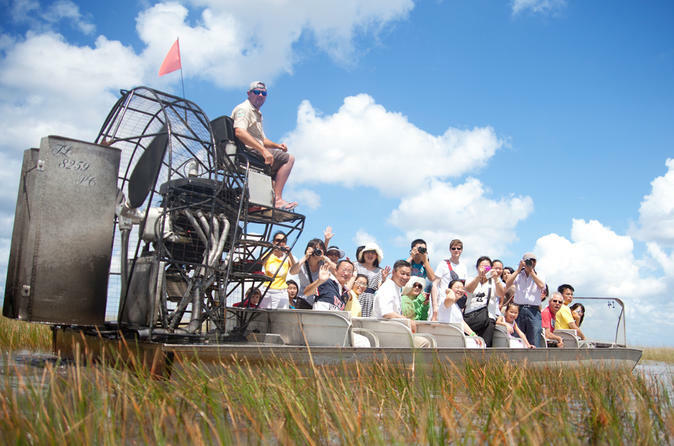 You'll be driven to the National Park, where you'll meet a local airboat guide and go deep into the wetlands, speeding through waterways and stopping to see wildlife. As you explore the sawgrass marsh, you may see alligators, turtles, and exotic birds. After the airboat tour, you will be able to see exotic animals up close including gators, snakes, raccoons and panthers. The bus leaves the park after the show, and you're back in Miami around 5:30pm. You will be taken you back to Bayside or Miami Beach at the end of the tour.